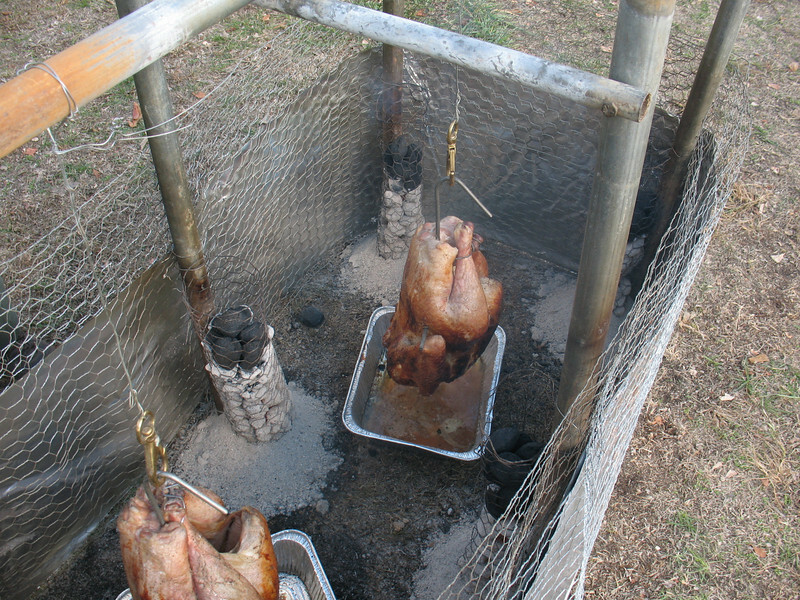 Each year, Troop 200 hosts the annual “Turkey Camp”. The event is open to Arrow of Light scouts that are interested in learning more about what it is like to be a Boy Scout and the Troop 200 scouting program. Arrow of Light scouts arrive on Saturday morning and after an opening ceremony, will rotate through skill and game stations. The afternoon typically includes an afternoon “campfire” with skits and songs, followed by a Thanksgiving style dinner, including turkey that is cooked outside during the day. Following dinner the troop holds a flag retirement ceremony and then prepares for a night outside. Arrow of light scouts are welcome to camp overnight. Hat, gloves, boots, raingear, etc. We will be outside for much of the day. Lunch and Dinner are provided – you don’t need to bring food. Tent(s). A scout and parent may sleep in the same tent, or several scouts can sleep in a tent, but non-relative scouts/adults must sleep in separate tents. Ground cloth for under your tent. Sleeping bag appropriate for the weather, and possibly extra blankets. A dry pair of clothes to sleep in. Personal medications and toiletry items. We require that each pack have at least one adult representative that is familiar with their scouts for the entire time your pack has scouts at the event. Often a den leader or an active scout parent are good choices. A pack is encouraged to have more than one adult in attendance, but we will provide the adults for two deep leadership if only one adult from your pack is available. For any pack leaders and parents that are at the event, we will hold some question and answer periods during the day on Saturday with troop adult and scout leadership so you get to learn more about the troop. The registration fee is $10 per person. This includes both scouts and adults. A BSA Health form (part A and B) is required for all scouts attendees and all adults spending the night.